As with many mini series, the point of the limited issue adventure is often left a mystery until the second issue. Punisher: In the Blood is such a series where this is the case. 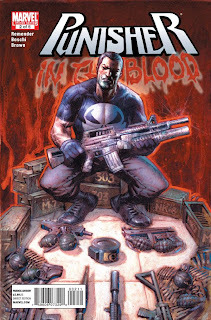 I didn't quite know where the Punisher: In the Blood was going until reading through Punisher: In the Blood #2, which is mostly several pages of Jigsaw explaining to his son about why he has stopped by his son's place. Usually what a mini series will do is try and keep readers interested by throwing in a last page surprise or reason to continue on to the next comic book. In Punisher: In the Blood #1, the comic end on seeing the return of Jigsaw, a character not seen in the main stream Punisher books in some time. This strategy can also be seen in a previous comic of the day Carnage #1. At the end of that book you see the alien Carnage symbiot sitting in a spherical case, in a lab. Not until the second issue of that arc does one see the direction of the Carnage story. Punisher: In the Blood #2 did contain a lot of "talking to", as in one character just telling another character something, but it was still enjoyable. The comic raises the idea that every tech person that runs with Frank, the Punisher, ends up suffering in some way for it. Jigsaw argues to his son that the Punisher ruins the lives of everyone around him, bad and good. Jigsaw is obviously trying to play some angle by telling this to his son (current tech helper of the Punisher), but even if he wasn't Jigsaw makes a good point. Two issues in, I'm satisfied. Now let's see where issue #3 takes us.